BAE 1073MPF Single-Channel with Filter and Power Supply. BAE 1073MPF Single Channel with Filter and Power Supply. 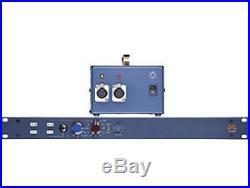 BAE 1073MPF Single Channel with Filter and Power Supply Microphone Preamp. The BAE (formerly Brent Averill Enterprises) 1073MPF is basically a deluxe 1073MP. Lt has all the same qualities as the 1073MP with one added feature, a high pass filter. We integrated the same inductor based high pass filter that's in the 1073 and added it here to the 1073MPF. Impedance select between 1200 and 300 ohms. Same 283 amp card as 1073. Same transformers as the 1073. Same hand-wired modular construction that BAE is known for. Two Class A preamps with direct inputs in a single rack space with an external power supply. High Impedance direct input for guitar and synthesizer. Output level control serves as gain trim between the 5 dB steps on gain switch. Balanced mic input and balanced +4 dB output are on XLR connectors off the rear of the module. Balanced line input is achieved through the LN switch on the front. Mic input impedance toggle switch between 1200 ohm and 300 ohm. Similar Class A preamp as NeveT 1073 equalizer/preamp modules. Pad is an integral part of the gain switch same as NeveT 1073 equalizer/preamp modules. Has integrated phantom power with a lighted switch on the front panel. Oversize remote power supply can operate up to four channels of preamp. The 1073MPF preamp yields a really fat sound. It seems to add subharmonics to the low end which makes the bottom end sound huge. It smoothes the top end, giving the highs a silky sheen. The BAE 1073 slightly compresses transients, as well. It is a smooth, fat, larger than life sound. An added bonus is to use the front-panel DI inputs to fatten samples and synths and instruments. Balanced line-level inputs on the rear allow for fattening and punching up entire mixes, or in a signal chain with other +4 gear. Set the gain knob (red Marconi) around 20 on the dial and set the output (grey knob) fully clockwise. This gives you the highest headroom and cleanest signal path. Another trick people like to do is to put the final mix through the balanced line inputs on the back to get that harmonic distortion. To get even more of that Class A output stage is to come out of channel 1 and into channel 2 then you have an accumulative effect of that classic output stage. THE MOST COMPLETE MUSIC STORE IN THE WORLD. The Most Complete Music Store In The World, Period. BEST OFFERS - Please submit offers directly using the "make an offer" button. We will consider your offer as soon as it is received. We will then either accept, decline, or counter accordingly. Please do not send a message or call Alto Music in regards to best offers. If a specific listing of ours does not include the "make an offer" button, we are then currently not accepting anything less than the BIN price for that particular item. Merchandise and packaging MUST be in the same condition as when received. Alto Music reserves the right to refuse any return if it appears the item has been used. There are no warranties for the following items: Strings Drumheads Drum Sticks. The item "BAE 1073MPF Single-Channel with Filter and Power Supply" is in sale since Thursday, July 30, 2015. This item is in the category "Musical Instruments & Gear\Pro Audio Equipment\Preamps & Channel Strips". The seller is "altomusic" and is located in Middletown, New York.